This unique service actively monitors the global security environment and proactively reaches out to your affected employees during a critical incident or crisis to ensure their well-being. This leading-edge technology works in conjunction with the SAP Concur® Locate platform, which provides a greater level of detail than the standard GDS booking tools. The system utilises granular traveller information that is integrated with your HR database in order to effectively pinpoint the location of your business travellers, expatriate workers and local nationals across the globe. When an incident occurs, we provide informed, relevant and timely alerts and advisories to affected employees. In the event of a critical incident, we identify any of your employees that may need assistance. Our unique ‘service over software’ approach provides clients with affordable access to state of the art security technology. This technology is delivered and managed by our 24/7 Global Security Operations Centres (GSOC). Incidents are geo-fenced and ‘at-risk’ employees are immediately identified; contact is then made to establish if assistance is required. Accurate, relevant and timely intelligence along with real-time alerts are disseminated to Risk Managers and affected employees. This information is sent in accordance with pre-approved, customised escalation processes. When required, emergency assistance is seamlessly provided. 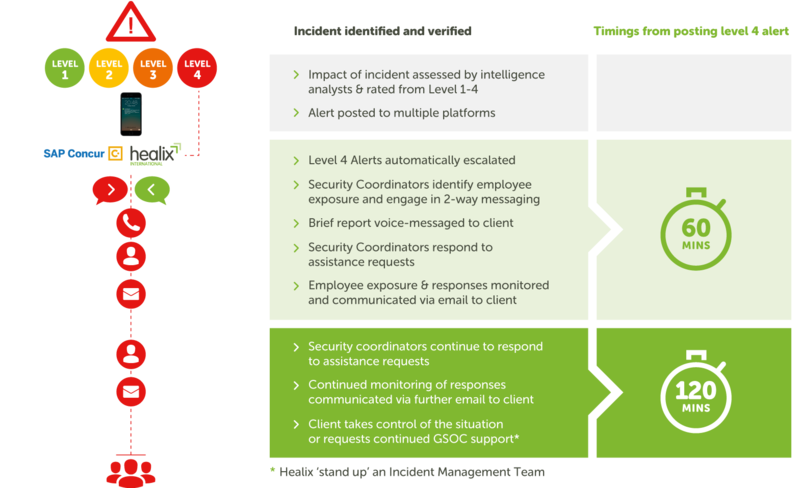 Healix Active Monitoring provides critical communication with impacted employees during an incident, and it also ensures you have the knowledge you need to brief stakeholders. From the initial incident right through to resolution, your organisation remains informed and in control every step of the way. This level of knowledge facilitates effective decision-making in a crisis and enables you to fulfil your duty of care. Benefit from industry leading technology and around-the-clock support from a team of global security professionals. Impacted employees are rapidly identified and contacted to determine if assistance is needed. Covers your local national employees as well as your business travellers and expats. If required, we can seamlessly provide on the ground medical, security and travel assistance to your impacted employees and their families.